Hi Vijay, since you are newbie here, I cannot send you a PM. Can you please send me an email on n.devdath@gmail.com or a whatsapp on 9243466235? My Endeavour's low beam was pointing quite low and I faced difficulty while driving on highways where I was hardly able to drive without high beam. I recently sorted out the low beam leveling issue with the help of a screwdriver by adjusting the screws present on top of headlamps. After the adjustment the vision is much better and I hardly switch to high beam while driving at night time. But I still feel the beam from both right and left lamps is not equal or better to say parallel. Are they supposed to be exactly in sync or there will be a slight difference? I have read the issues earlier reported in this thread based on them does my car also require headlamp replacement. I am planning to get this checked in next service but not sure if the SA will agree to my points. Is there a way I can provide them the necessary artifacts to prove my point. My car manufacturing date is April-2017(with Navigation) and I assume that this issue was rectified in 2017 model. 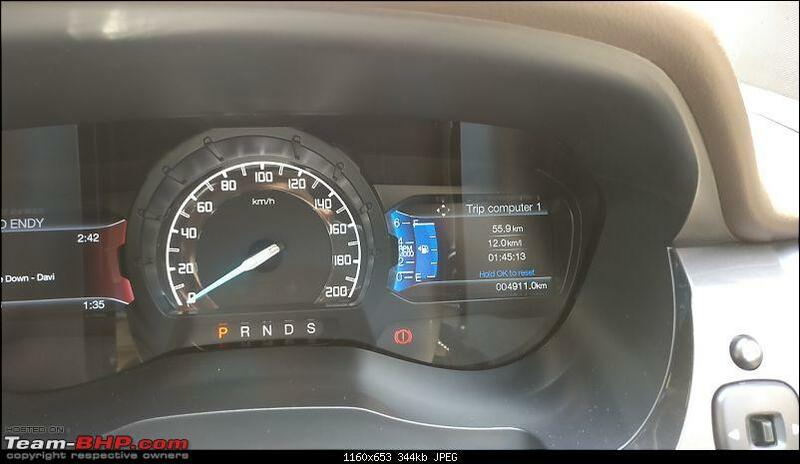 BTW: Wanted to share the best mileage(read >12kmpl) I got few months back with super light foot on accelerator. Pic attached for reference. Again a upward price revision by Ford..
Prices as of October 2017 were atleast 60k less on an average. E.g. Top Spec was 31.7L Ex and now 32.3Ex. Increase the price and then give discounts by December. Wonderful. 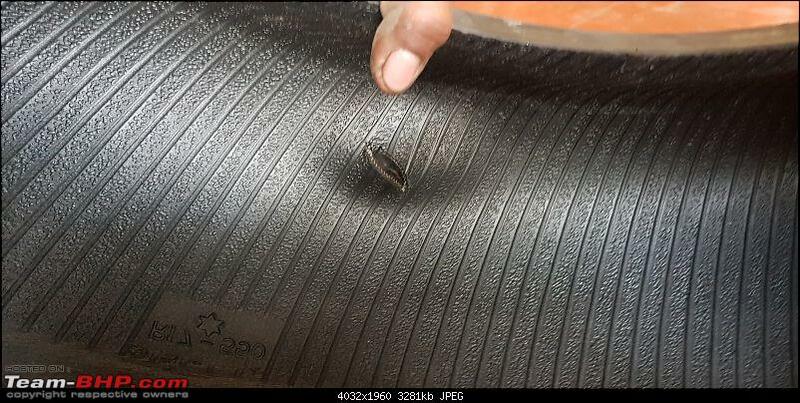 Now with Jan 2018 approaching, again Ford will revise prices upwards stating rising input costs..
Had a terrible experience with MRF Wanderers - lost one tyre (nasty sidewall). Strongly recommend any new owners to replace tyres at the time of purchase (most economical time) to a Yoko or something else. Does your Endy come with auto levelling lamps? I faced a similar issue where both the low and high beams barely lit not more than 15-20ft and where totally out of sync as well. Got it replaced with some effort. You may check my previous post here in this tread for a possible resolution. Had a panic call from my driver earlier this morning while I was not in town. My Endy had a good 60KM ride yesterday and I am being told that nothing was amiss yesterday. Today morning while the truck was being driven for a short trip the driver noticed white smoke emanating from the exhaust and immediately brought it back home. I was told that In the 2 minutes while the car was parked within my home the entire place was filled with white smoke to the point of no visibility. The driver immediately called the local ford dealer/SA and was told that there has been similar instances of this happening and the SA asked us to contact Ford helpline/toll free wherein the car will be towed and "an" assembly will be replaced by Ford at no extra cost. Tow has been scheduled for tomorrow. Since I have just returned home I couldn't discuss this and neither do I want to crank the engine to observe the smoke myself risking any further damage. It's surprising that the SA has informed that this is a known issue. Has anyone faced this issue? "Battery Saver" message is flashed in the screen and the car electronics shuts down. This has happened 6 times this year to the point where the truck doesn't crank at all. I had to use jumper cables each time to get the battery charged up. Except for a Dashcam/Android-MirrorCam, which is connected to the driver seat/front 12V socket, I dont have any extra electronic devices connected. 2) Rear left indicator has gone dead last week. Do these things have to do something with this white smoke issue now? Last edited by theMAG : 13th December 2017 at 01:36. Reason: Back-back posts < 20 mins. Please EDIT moving forward. Is this the latest software? I told the SA to update it. This may be due to a diesel leakage in the engine bay and the heat is building up the smoke. A similar thing had happened with my cousin's punto and it filled the whole house with smoke. Good thing was the all mosquitoes were driven away with the smoke. the SA asked us to contact Ford helpline/toll free wherein the car will be towed and "an" assembly will be replaced by Ford at no extra cost. Tow has been scheduled for tomorrow. Just got a call from the SA. According to him, this is a known issue with the Endeavour and my truck is the 5th one to come to their center with the same issue. The problem seems to be an internal capillary tube around the ECR (??) valve bursting. This causes coolant leakage into the exhaust which gives rise to the white smoke. Apparently a modified part has been introduced it seems and the same will be replaced for me pending approval from Ford. Shouldn't this qualify for recall and replacement in all Endeavours? I got it done today at Metro Ford. And there is a difference in the pickup between gears. Overall feels smoother. There is no other terminology. If the SA there does not understand PCM, then he is the wrong person to speak to. Ask for a senior Service person. Here in Metro all of them know PCM, TCM, and even Music system/Touchscreen/Sync update which is ACM/AICM. I had almost 5 of the packages obsolete in my Endeavour and all were updated in less than 30 mins. One good thing about Metro is that they open at 6 am so early mornings are less crowded and we also get to avoid the "famous" Bangalore traffic. When was the last time you took your Endy to the service station? I went for my first service around 1st week of November and Metro Ford did a PCM update. 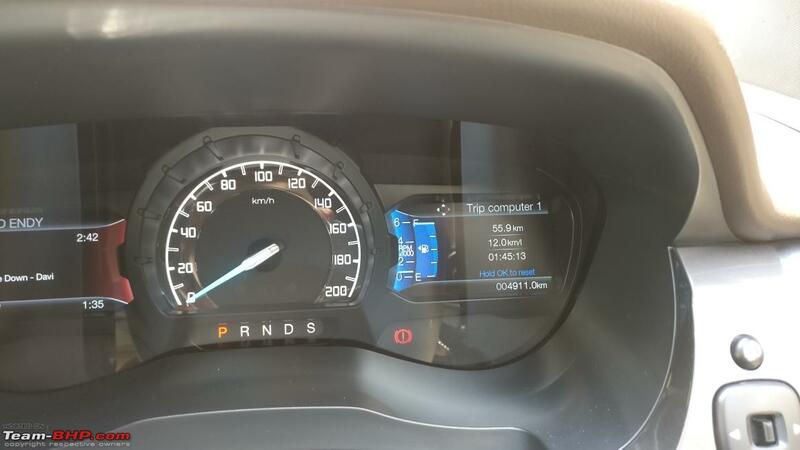 However, I don't know how to tell if the pickup between the gears has changed as my experience driving the Endy has only been a couple of thousand KM and i am still learning about the beast..
Any inputs on how I can check that? 3.10.16180.EA.0 seems to be the latest one. As LionX pointed out, the only way to check is the version on the panel. Other than that, if you are not feeling a major difference in performance, perhaps your earlier version was closer to this one and hence. In my case, I had a one year old version and hence I could feel the difference. They release a new version almost every 2 months. Mine is one lower than the one pointed below. Got a friend's 3.2 Titanium updated. 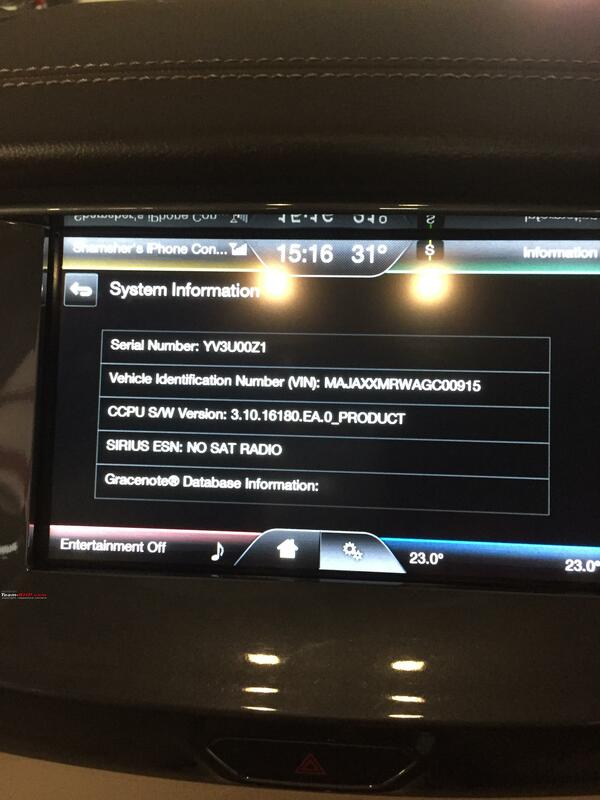 The update covered both the GB part as well as infotainment part. # The GB has gotten smoother, there is less of lag as well as noise. 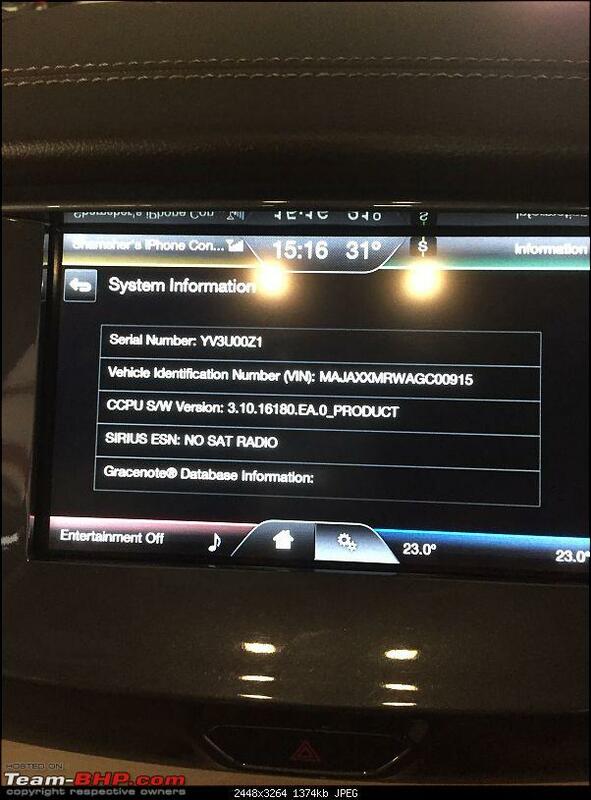 # There maybe other updates/features in infotainment but we couldn't check. A big thanks to BHPian n.devdath who not only updated us here about the update but also helped me at Ford ASC, who were initially lax in their attitude but a call made them look into it and do this job. Thank you. Last edited by Sheel : 16th December 2017 at 21:10. Glad to be of help there. Could you please elaborate on these new features with photos if possible? What should be the price for a 2 year old 3.2 well maintained endeavour?